Bitternut, Swamp Hickory (Hicoria minima, Britt. )A tall, handsome tree, 60 to 100 feet high, with straight trunk, stout branches and slender twigs, forming a broad, symmetrical head. Bark greyish brown, smooth, close; branches smooth; twigs yellowish brown, pale, dotted. Wood brown, heavy, hard, close grained, tough. Buds slender, pointed, yellow, granular. Leaves alternate, compound, 6 to 10 inches long, of 7 to 11 narrow, almost willow-like leaflets, bright green, paler beneath, leathery; yellow in autumn; petioles downy, slender. Flowers in May, with leaves; monoecious, staminate catkins, 3 to 4 inches long, in threes, stalked; pistillate on terminal peduncles, t to 3 flowers, 3/4 inch long, with spreading stigmas, green. Fruit globular, or pear shaped, 3/4 to 1 inch long, wider; husk thin, with 4 prominent winged sutures, reaching half way to base; sometimes 2 go to base, never 4. Golden scurf on husk. Nut thin shelled, compressed, marked with dark lines; kernel bitter, white. Preferred habitat, low wet woods; swamps. Distribution, Maine and Ontario to Florida; west to Minnesota, Nebraska and Texas. Uses: Valuable ornamental and shade tree, not yet appreciated. Wood used for ox yokes, hoops and for fuel. The bitternut is known among the hickories by its flattened, tapering, yellow buds, which it always carries, no matter what the season. There are always dormant buds in spring, even when growth is at its height. One needs only to follow along any twig to discover several of such lateral ones of the previous year. Very soon the new buds thrust their little yellow noses up from the axils of the leaves, and you have there the sign which remains until growth begins next spring. The bark of H. minima is close and thin; the habit of the tree is like a hard maple's; its leaflets are, the smallest among hickories, and the twigs are the slenderest. One need not depend on the fruit as an identification sign. The smooth, round nut comes easily out of the thin shell. But the kernel, white and plump, is bitter as gall. No woodland creatures eat it. This is one of the reasons why the trees are so numerous. Nuts roll away from the parent tree, and are privileged to grow, while edible nuts are devoured. 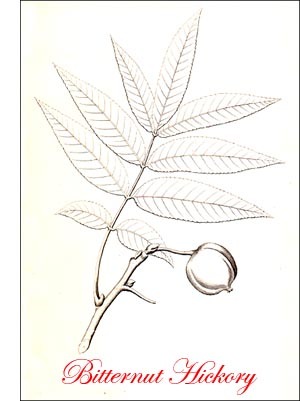 The bitternut has all the good qualities of an ideal park tree, and excels the other hickories in rapidity of growth. The landscape gardener of the coming generation will know and appreciate it, for the native trees are receiving more and more consideration, and their names are appearing, in increasing numbers, in nurserymen's catalogues.